Discipleship. This is a word that until six years ago, I used loosely. I’d attend a “discipleship” class at church, I’d learn about “discipleship” in Sunday School, or I’d refer to a Bible Study as having a “Discipleship” focus. It wasn’t until January of 2010 that I really began to understand the true meaning of “Discipleship” as we kicked off the very first Run for God class. “Discipleship” and “Following Christ” are often used synonymously, so we can surmise that a “Discipleship Class” is a class that teaches us how to be a better follower of Christ. When I started the very first Run for God class on a cold Tuesday night in January of 2010, I really didn’t know what kind of class it was going to be. All I knew was that I was terrified of leading a Bible Study and speaking in front of people. Have any of you been there? That first class kicked off, and God seemed to have His hand on it from the very first word. We were all learning to relate our faith to the sport of running. Everyone in that first class was a member of Grove Level Baptist Church and all were secure in their faith. A “discipleship” class is exactly what it turned into and still is today. Over the years however something began to happen in Run for God classes all over the world. Instructors began reporting back to us stating that people were getting saved as a result of their class and that people were showing up who had never been part of a church. This was something that honestly I did not see coming. I understood very well the parallels of faith and endurance, but I had never really sat and thought about the fact that those lessons could be used to bring people to the Saving Grace of Jesus Christ. Wow! Over a period of months, this got me to thinking about The 5K Challenge in general. Should it remain a “discipleship” program, or was God calling me to make yet another very uncomfortable shift, and focus our efforts on making this program more about evangelism? 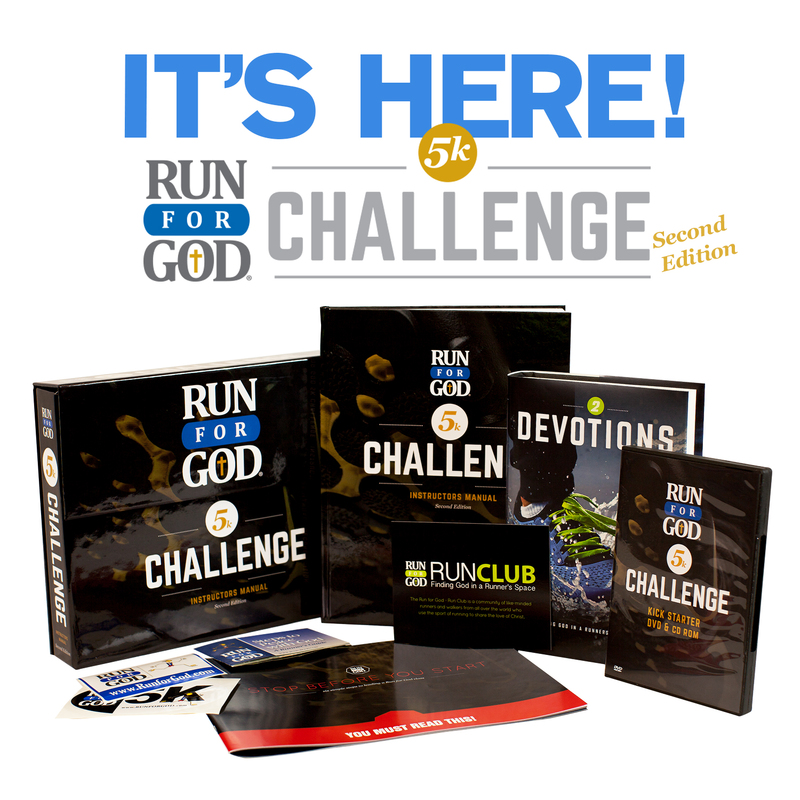 On November 15th the Run for God – 5K Challenge – Second Edition will begin rolling out. The program has been completely rewritten with the help, input, and talents of many great people. We have taken your suggestions and ideas, coupled those with the principals that we feel will take this study to the next level, and compiled a format that has both “discipleship” and “evangelism” components to it. Yes, we do still cover a lot of material that teaches us “believers” how to be a better follower of Christ, but rest assured that the Gospel of Christ and The Plan of Salvation are clearly presented in this new study. It’s unmistakable and it’s going to be life changing for many people. Also new to this series is an Ice Breaker DVD series. This is a video that you will play at the beginning of each week’s class that will get everyone’s attention. You’ll be seeing serious videos, some funny video’s, and you’ll be hearing from someone on our team each week. Many of our awesome Instructors have asked for more direction and “meat” in the study. Well, now you’ve got it! The all-new Instructor’s Guide is about as comprehensive as you can get. Each week we give you all the direction that you need to lead a successful class and feel comfortable about what you are doing. Whether you’re a new instructor or a seasoned instructor, I feel that The 5K Challenge – Second Edition is going to take your teaching experience to the next level. I hope you will join us!